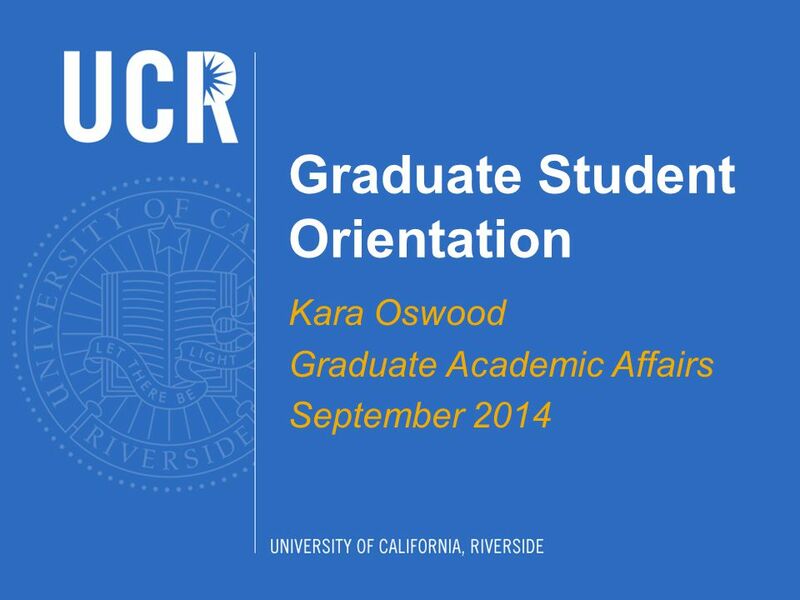 Graduate Student Orientation Kara Oswood Graduate Academic Affairs September 2014. 7 Forms and Petitions – use petitions to take action, such as transfer units or take leave of absence, etc. 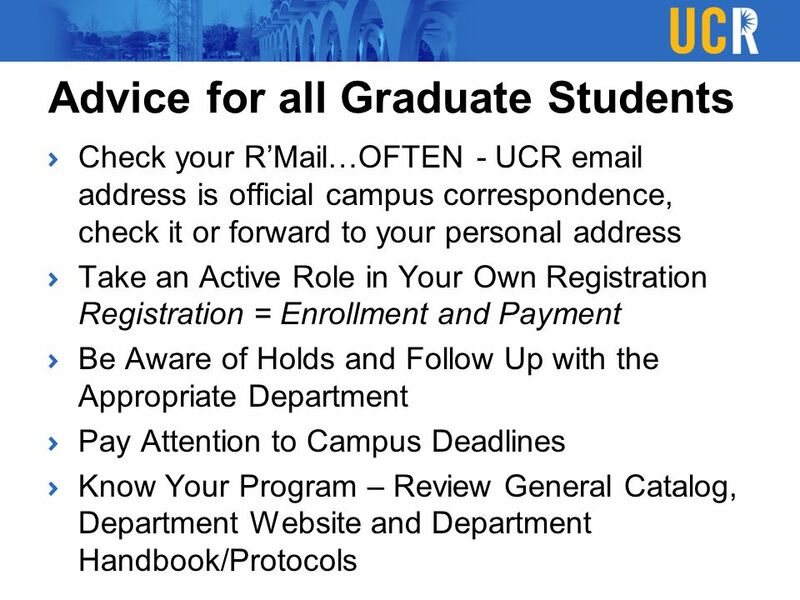 Student Handbook – everything you need to know about being a graduate student at UCR. Dissertation and Thesis Submission Academic Rules and Regulations – campus wide regulations for master’s and PhD programs. 8 Forms and Petitions Student Handbook Advancement to Candidacy This Presentation! 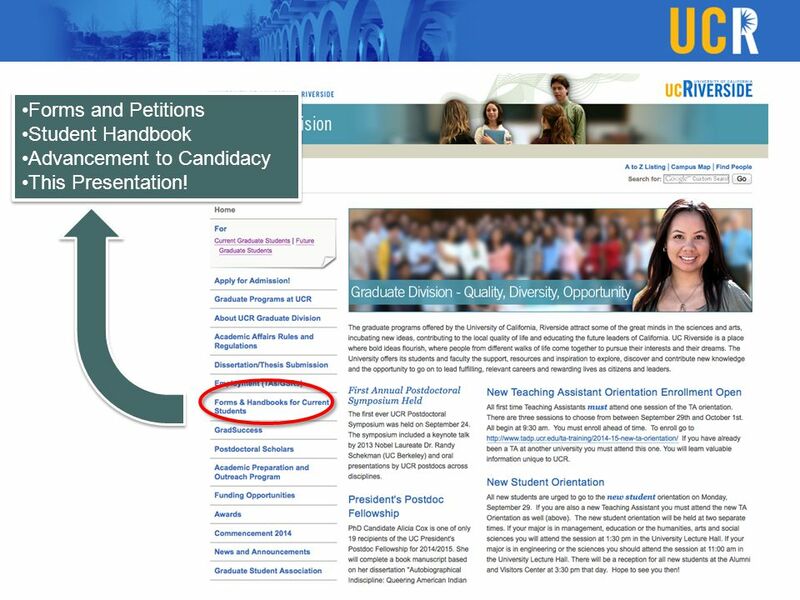 Forms and Petitions Student Handbook Advancement to Candidacy This Presentation! 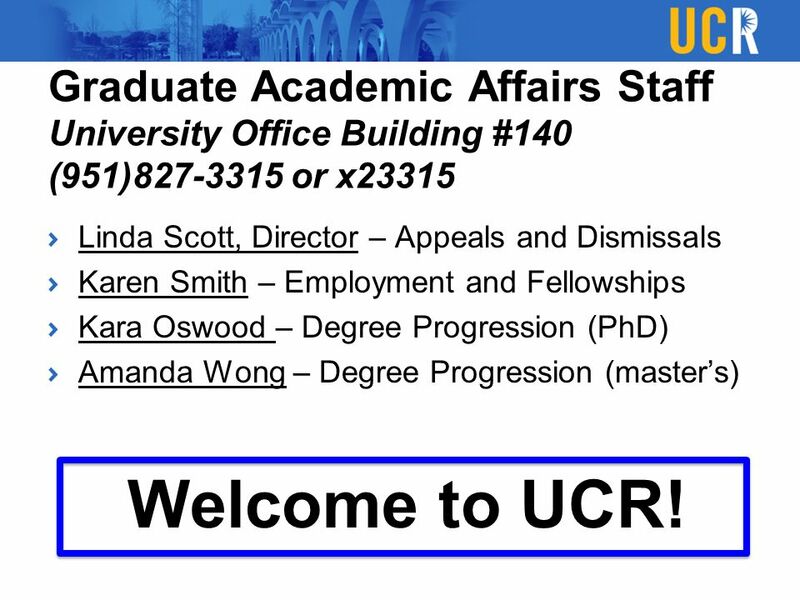 13 Graduate Academic Affairs Staff University Office Building #140 (951)827-3315 or x23315 Linda Scott, Director – Appeals and Dismissals Karen Smith – Employment and Fellowships Kara Oswood – Degree Progression (PhD) Amanda Wong – Degree Progression (master’s) Welcome to UCR! 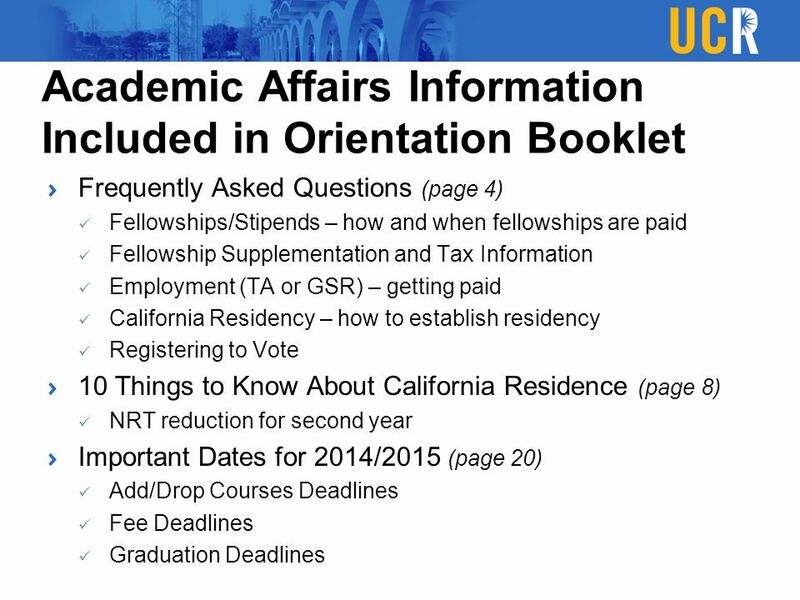 Download ppt "Graduate Student Orientation Kara Oswood Graduate Academic Affairs September 2014." One Portal to Open it All Matthew Vanden Boogart Amanda Mesirow Aggie Witowski Portal Conceptual Development Team Ellingsburg University. Internships for F-1 International Students Curricular Practical Training (CPT) authorization for International Student Internships. Academic Program and Unit Review at UIS Office of the Provost Fall 2014. 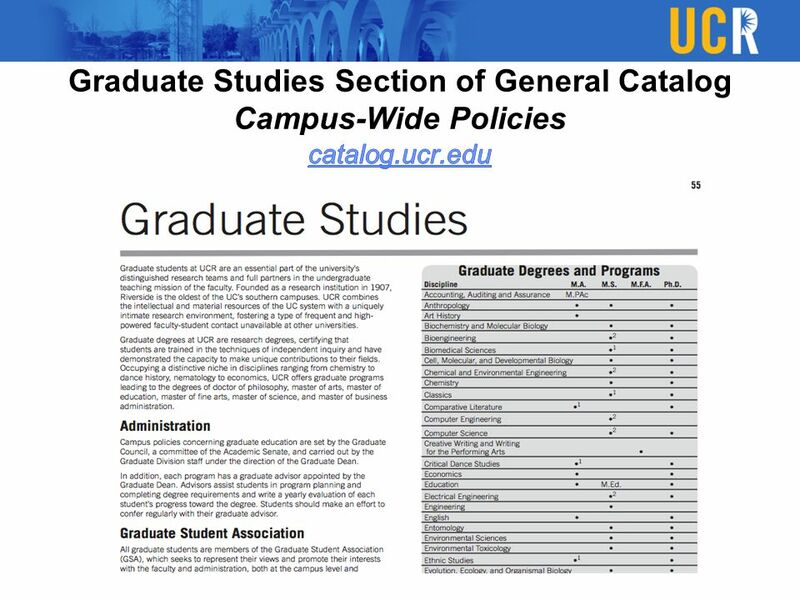 Graduate Student Orientation Enrollment Services Overview 2014 August 13, 3:30-4:20 University Center, Rangos 1. 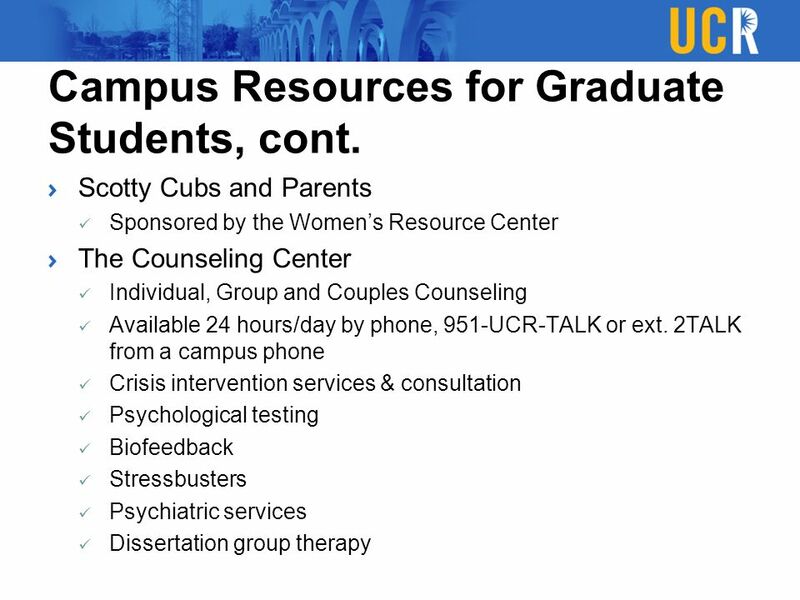 Psychology Graduate Student Orientation. 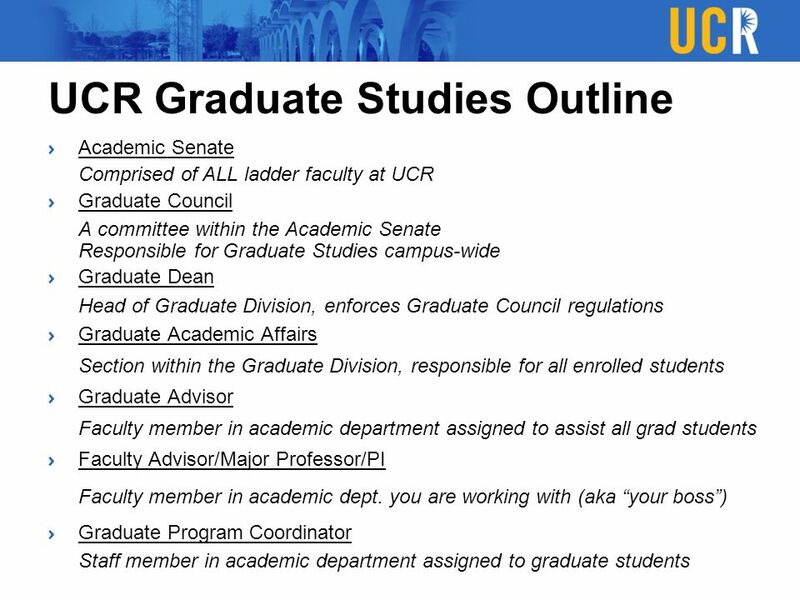 Graduate Students. 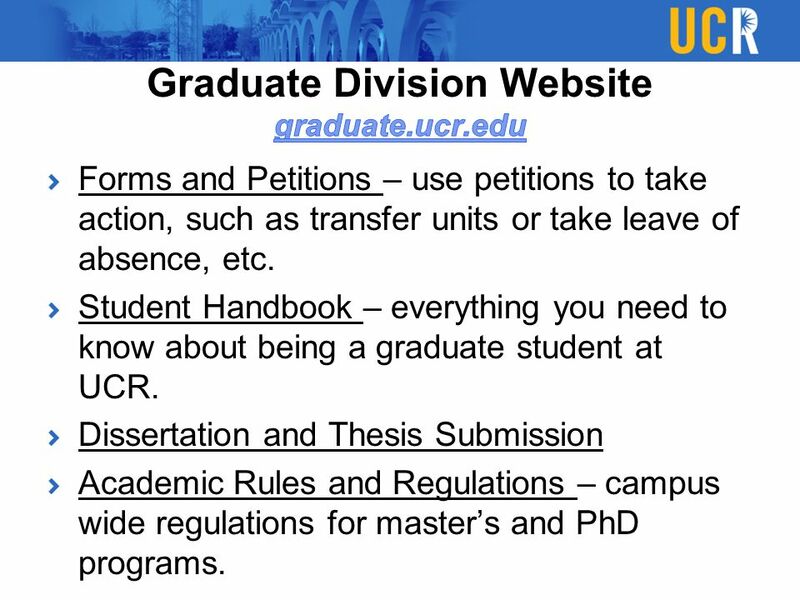 Graduate Research Degree Orientation 2013 Decision Making and Governance. 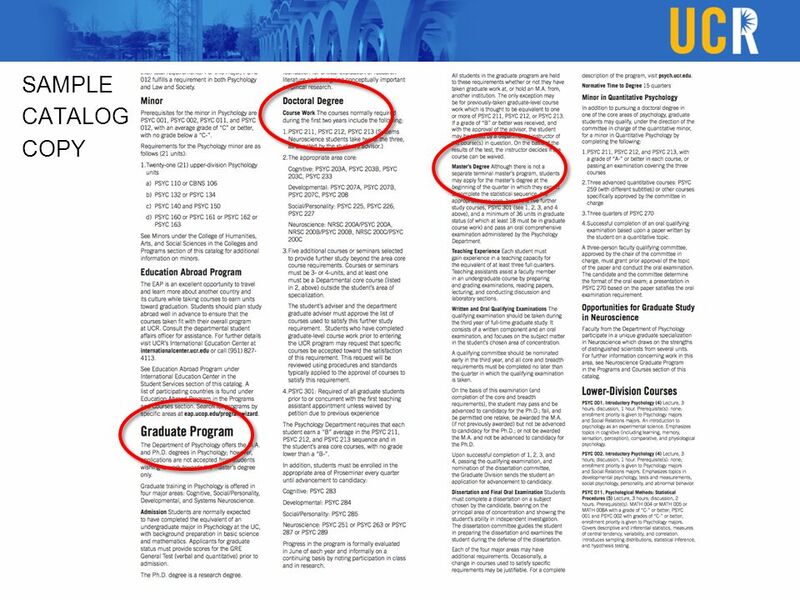 Advancement to Candidacy MA-Psychological Research MS-IO MS-Human Factors. Agenda: 6:30 Sandwiches and Beverages 6:45 Presentations. About Team 2 What is Team 2? The Engineering Research Support Organization (ERSO) functions as a central hub, providing research administration. THESIS FORMATTING & SUBMISSION WORKSHOP Creative Writing and Writing for the Performing Arts Palm Desert Campus – December 2014 Kara Oswood – UCR Graduate. 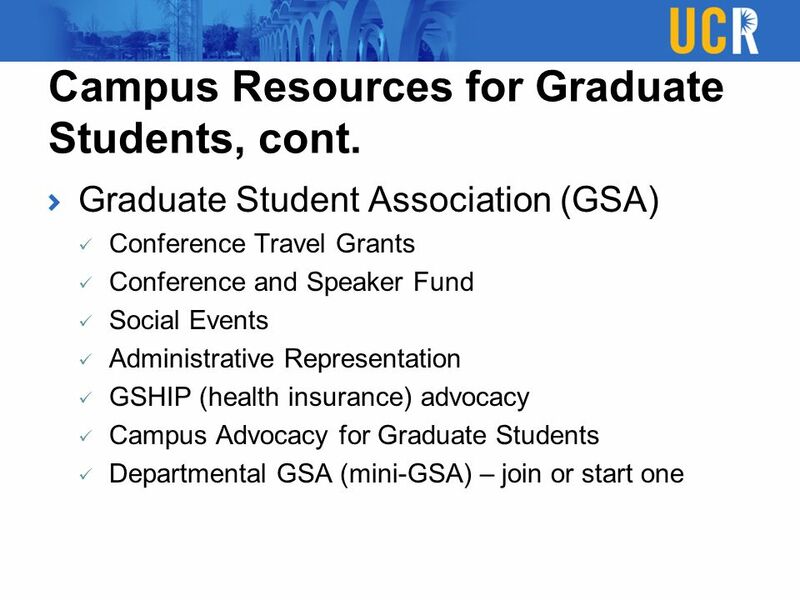 GRADUATE COORDINATORS WORKSHOP October 4 & 7, 2011. 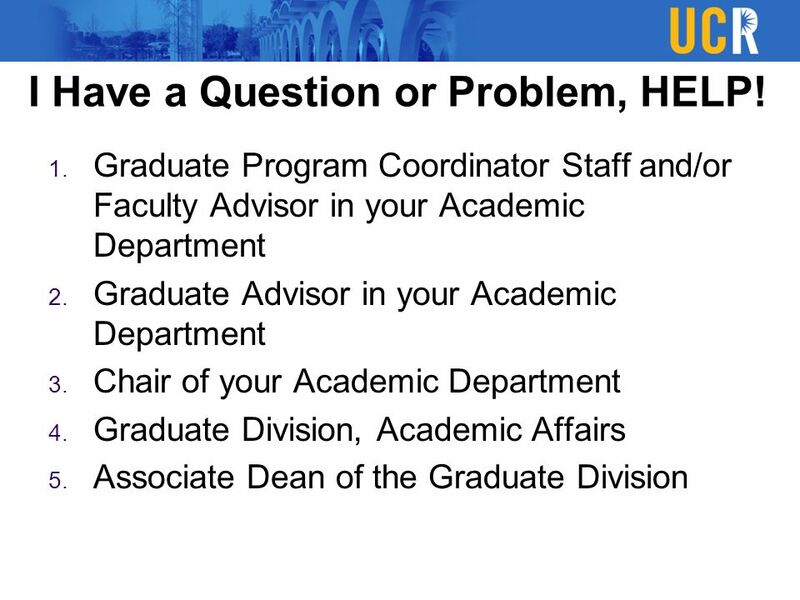 Academic Advising. Office Hours Walk-in: Monday 8-11 Friday 8:30-11, 1-4 By Appointment : Tuesday-Thursday Phone: Find us on North Campus in. 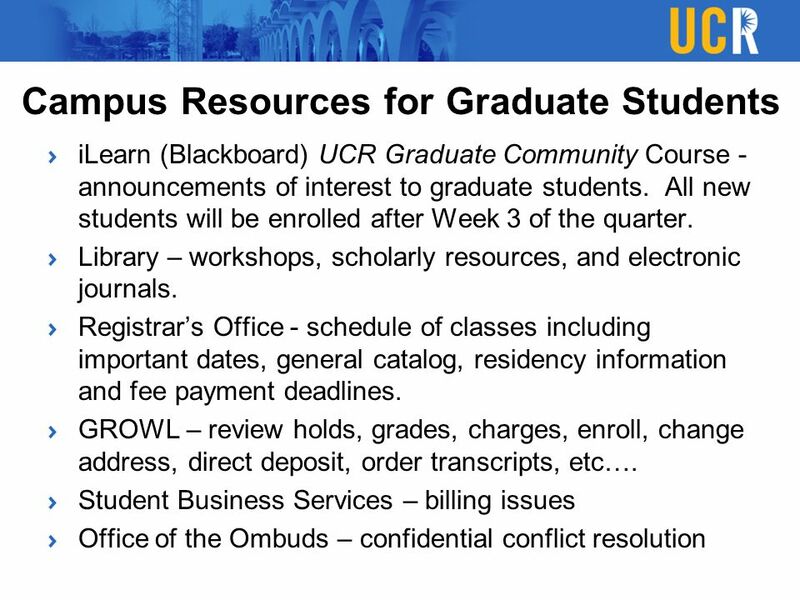 Office of Graduate & Professional Education 0 Financial Support of Graduate Students May 21, 2009 Part One of Two. Council of Graduate Students General Assembly October 18, 2006. Materials Science & Engineering Graduate Program Orientation September 28, 2010 Bourns Hall Room A171 Materials Science & Engineering Program. Office of Graduate & Professional Education May 21, 2009 Financial Support for Graduate Students.